If you’ve ever tried sleeping with just the tent floor and a sleeping bag between you and the hard, cold ground, you know how important a sleeping pad is for a good night’s sleep when backpacking. The challenge is that it is one more heavy and bulky piece of gear to carry on your back. The good news is that you can get the insulation, support, cushioning, and warmth you need to sleep comfortably while backpacking without adding a lot of weight and bulk to your backpack. The best backpacking sleeping pads are comfortable, lightweight, and fold down impressively compact. Below are ten best ultralight sleeping pads that offer a great sleep and toting experience. They won’t drag you down during the day and they will ensure you have a comfortable place to lay down after a long, tiring day. Klymit's innovative, lightweight, compact, and comfortable sleeping pads deliver great sleep experiences outdoors. 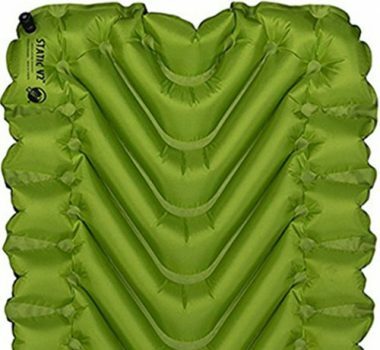 This affordable Static V Klymit sleeping pad is a great entry level backpacking pad. It is uninsulated with a 1.3 R-value and, therefore, designed for warmer weather. The V-chamber design isn't just for aesthetics. It reduces air movement and heat loss through convection and offers better ergonomic support and comfort whether you're sleeping in a hammock or on the ground. The design and side rails also ensure you don't slide off the pad. Inflation takes only 10-15 blows. The valve opens wide for rapid deflation. Rolled and packed into the stuff sack, it is about the size of a can of soda making it very easy to store and carry. The rugged 75D polyester material resists tears, punctures, and abrasions well and this pad is built to last. Another good thing is that this pad doesn't make crinkly noises when you toss and turn. It also features an antimicrobial laminate that keeps it fresh and healthy. 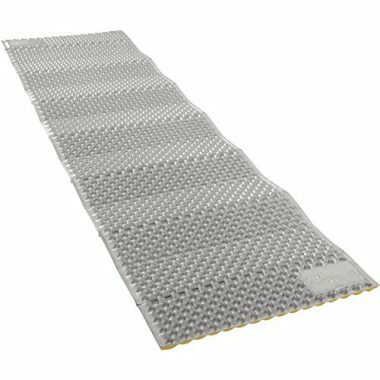 On a tight budget and need an ultralight and ultracompact but comfortable sleeping pad for backpacking? This pad by Outdoorsman Lab fits the bill. When packed, it takes no room in your pack but rises into a pretty comfortable mattress whether you're using it on a hammock, sleeping bag, or hard surface. It is 2" thick, and made of interconnected air cells that conform to your body to provide optimal comfort, support, and warmth. The air cells limit air flow reducing heat loss due to convection and the surface is slip resistant and reasonably quiet. It is on the long side, which makes it great for tall people. It has a large air valve and inflates in 10 - 15 breaths. Deflation is in seconds. It is ultralight and folds down into an ultracompact size smaller than a water bottle. It's made of 20D ripstop nylon and TPU coating so it holds up well. With an R-value of 1.3, it is good for warm weather backpacking. You can also use it with a foam pad underneath when sleeping on snow. WellaX designed this Chillax sleeping pad to offer the most comfortable portable sleeping experience and they achieved their goal. It offers an impressive combination of comfort, support, warmth, and weight. It is one of the best ultralight sleeping pads, packs down into a tiny package, and grows surprisingly thick when inflated becoming one of the most comfortable backpacking pads available even for side sleepers. This sleeping pad is unbeatable without spending three to five times more. A single layer of air cells makes it one of the lightest sleeping pads without giving up comfort and warmth. It is pretty thick, wide and long, and cushiony even for large and restless sleepers. The flexing air cells offer stability and support. The surface is grippy and virtually silent. A 2.1 R-Value is sufficient for spring and summer. Featuring two flat valves, it inflates and deflates quicker than is standard. It inflates with less than ten blows and does not deflate unless you release the second valve. It packs down to the size of a soda can making it easy to stow inside your backpack. Construction using laminated 20D Rip-stop nylon and the TPU Layer makes this pad waterproof and very resistant to tears and abrasions. This is a very comfortable self inflating sleeping pad that offers a high level of insulation and cushioning. This is because it has a 3 - 4 R-value insulation and uses both foam padding and air cushioning. It will keep you warm and comfortable even in cold temperatures. Another outstanding feature this sleeping pad has is its ease of use. All you have to do is twist the valve open, unroll the pad and it will start to inflate itself. To complete the inflation to your desired comfort, it does require that you manually blow air into it. It will also self-inflate fully if you leave it open for several hours. To deflate, open the valve, fold in half and roll up. For a self-inflating pad composed of both foam padding and air cells, it is impressive how lightweight it is and how compact it packs up. It is still on the bulky and heavy side for backpacking but the quality and good night's sleep it offers is worth it. The 75D polyester outer shell is sturdy, resistant to punctures and durable. 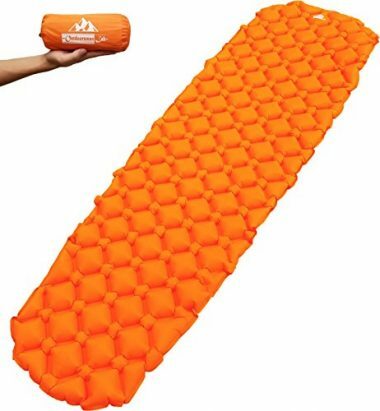 If you love the convenience of self inflating sleeping pads, this pad by ALPS Mountaineering is a great value and surprisingly comfortable for how thin it is. The jet stream foam and air are very effective at insulating and cushioning from the hard, cold ground. It comes in many sizes so you can choose your preferred size and weight. It inflates and deflates easily and quickly. Just open the cap and let it fill up with air. You then need to blow a couple of breaths to get it fully inflated. For storage and transport, it rolls up compactly to fit into its stuff sack with compression straps. You can then strap it to the outside of your backpack. This is a high-quality pad built to withstand years of use outdoors. The top fabric is a tough, ripstop polyester that resists abrasion and the bottom is polyester taffeta. The brass valve is non-corrosive and durable. The Therm-a-Rest Z Lite Sol is one of the best foam sleeping pads. It is ultralight, hassle-free since it doesn't require inflating, and easy to pack. It is ideal for hammock sleeping in the summer, late spring, or early fall. A 2.6 R-Value insulation, reflective coating that reflects heat to your body and heat-trapping dimples ensure you're toasty warm. While its temperature comfort is excellent, ground comfort is lacking because it is thin. On its own, it won't provide sufficient insulation or cushioning from hard or snowy surfaces but it makes the perfect foundation underneath an air mattress. Used this way, it boosts insulation while protecting the air pad from punctures and moisture. Since it is not prone to punctures, it is durable and dependable. It won't deflate on you in the middle of the night. The top is soft for comfort while the dense bottom offers insulation, durability, and cushioning. The folding accordion-style design makes packing a breeze. You can then strap it to the outside of your backpacking pack. Regular: 72 x 20 inches (20 x 5 x 5.5 inches, folded), Weight: 14 ounces. With a comfort temperature rating of 10° F / -10° C and 2.2 inches thick, the Hybern8 sleeping pad will keep you warm and comfortable in a variety of conditions. Its size is excellent. It is longer and wider than is standard yet lightweight and compact. It is a very comfortable and durable sleeping pad for the money. The contoured FlexCell honeycomb design traps air and provides support, insulation, and comfort whether you're using it in a hammock or sleeping bag. The slightly tapered shape can fit inside a sleeping bag and you can also sleep on it. Inflation is super quick and easy thanks to the innovative one-way valve. It takes about 10-15 breaths to fill it and it stays inflated. Deflating and rolling it is also easy and quick. For carrying, it is ultralight and packs nice and small into the included stuff sack. It is well made to last of a sturdy woven 70D ripstop polyester fabric that is non-slip, noiseless, soft to the touch and resists tears. The Insulated Static V sleeping pad is one of the best backpacking sleeping pads. It offers 4 season insulation and comfort making it extremely versatile and a great value for money. This insulated Static V LITE offers the same comfort and convenience as the original but is made using advanced materials that cut the weight by 22% making it the best ultralight sleeping pad for 4-season backpacking, avid, and ultralight backpackers. This sleeping pad utilizes synthetic insulation to keep you warm and has an R-Value of 4.4. The ergonomic V-shaped design provides cushioning, comfort and insulation while the side rails prevent slipping and reduce heat loss by convection. The high loft makes the Static V LITE one of the best sleeping pad for side sleepers. The pad takes 10-15 breaths to inflate and the valve opens wide for quick deflation. The pad packs small into the included stuff sack. The 30D polyester fabric is tear, puncture, and abrasion resistance. An anti-microbial laminate keeps the sleeping pad smelling fresh and free from microorganisms. For an inflatable air mattress, it's not crinkly noisy. 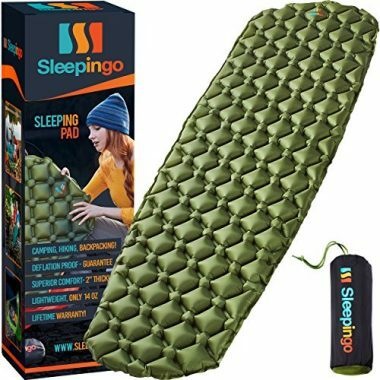 Incredibly lightweight, compact, generously sized, comfortable and affordable, this sleeping mat by Sleepingo is definitely one of the best ultralight sleeping pads. 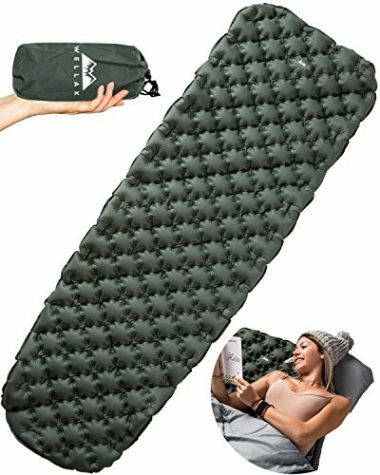 Even backpackers who own and have used this pad rave about it - it is a top rated ultralight sleeping pad. It is long when inflated and accommodates tall frames. With an R-value of 2.1, you will be warm and toasty even during cool nights. Its size, thickness, and design make it extremely comfortable for any sleep position. The interconnected air cells elevate you from the cold ground and adjust whether you sleep on your side or back. It holds weight very well even for large and side sleepers. It is recommended to add a couple of breaths for extra support if you weigh 350lbs or more. It inflates in 10-15 breaths and stays inflated throughout the night. In the morning, deflation is a matter of seconds. Its packed-down size is comparable to a thin water bottle which means it doesn't take much room inside in a pack. Made of a sturdy, waterproof, abrasion and tear resistant 20D nylon and treated with a TPU coating, it can withstand beatings in the backcountry to offer long-lasting comfort on the trails. The fabric is also soft and quiet. You can never go wrong with Klymit sleeping pads for backpacking. They are lightweight, compact and comfortable. This brand has a knack for innovation and is constantly improving their products. This Klymit Static V2 Sleeping Pad is the improved version of the Static V. It is 12% lighter but just as comfortable and durable. Klymit made it using advanced polyester, which is lighter and compact when packed making it even more backpacking-friendly. This pad is very comfortable to sleep on. The innovative V-chamber design and side rails offer superior support, comfort, and insulation offering comfortable sleep whether you're sleeping on the ground, cot or hammock and for all sleeping positions. This pad isn't insulated and suits warm conditions. This pad inflates in 10-15 breaths and the good thing is that it holds the air. The valve opens wide for rapid deflation. It folds down super small into the stuff sack. It is rugged and durable. The top fabric is a soft 30D polyester while the bottom is made of a more rugged 75D polyester that is tear, puncture and abrasion resistance. The anti-microbial laminate keeps odors and microorganisms at bay. The kind of sleeping pad you have can make or break a good night’s sleep when backpacking. You want it to offer you the warmth, comfort and cushioning you need for a good night’s sleep but be easy to carry on your back as you trek, hike or climb. It is important to pay attention to details when picking a sleeping pad. Here is what to consider to ensure that you make a good choice. How well a sleeping pad will be able to keep you warm is the number one consideration when buying a backpacking pad. The cold ground beneath has the ability to take away your body heat faster than the cold air around you. A sleeping pad acts as a barrier between your body and the cold ground preventing this heat loss. Another way you lose heat is by convection due to air movement. This is why it gets cold when sleeping in a hammock. A sleeping pad reduces this kind of heat loss by limiting air movement. The R-value is what tells you the level of insulation a pad provides. It indicates how well the pad is able to resist heat loss. What R-value you need will depend on the conditions you will be sleeping in. Low R values of 0-3 are okay when it is warm. 3-season pads usually have R-values of 3-4. Winter backpacking and sleeping on snow requires more insulation. You will need an R-value of 4-6 when the temperature dips to around or below freezing. Extremely frigid winter conditions call for a 5+ R-value. Some pads will have a temperature rating that will tell you the kind of conditions they are designed for. Incredibly comfortable, lightweight and the most compact, air pads are ideal for backpacking. They use air for cushioning, provide excellent cushioning and insulation and are very comfortable. Inflation is by blowing manually but some models have built-in hand pumps while some work with external hand pumps. Their disadvantages are that they are susceptible to punctures and can deflate in the middle of the night. These use a combination of open-cell foam insulation and air for cushioning. They offer convenience, decent durability, and comfort. Inflating them is as simple as opening the valve and leaving them to fill up with air. They are more puncture resistant than air pads and some backpacking versions can be folded and rolled into a very compact packed size that fits inside a pack. These are made of dense foam filled with tiny closed air cells. They are the cheapest, lightest, hassle-free, multipurpose, offer good insulation and aren’t easily punctured or damaged. On the downside, they tend to be stiff, bulky, less comfortable than inflatable pads. Thickness is one of the most critical features of a sleeping pad, as it affects how warm and comfortable a pad is. Choose a sleeping pad that has a reasonable thickness – at least 2″ and even thicker if you’re a side sleeper or backpack in cold conditions. This will ensure there’s cushioning between your body and the cold, hard ground. Thickness also affects air circulation and insulation. With a thin pad, there will be more air movement and you will lose heat through convection. A noisy sleeping pad is bothersome especially if you tend to toss and turn a lot. It can ruin your and others’ ability to get a good night’s sleep. New air pads tend to make crinkly or squeaky sounds when you move around but they quiet down after some nights. 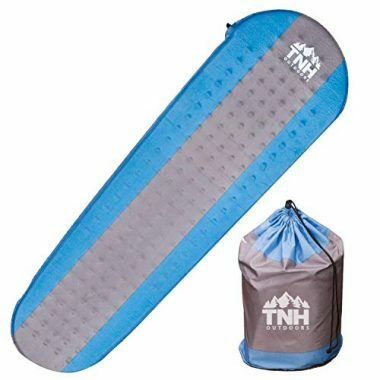 Before you purchase a pad, check backpacking sleeping pad reviews by users to see whether there are complaints that it is an annoying noise maker. Your sleeping pad will be one of the heaviest items in your pack and a lightweight backpacking sleeping pad is ideal. You’ll find options ranging from ultralight pads weighing 12 ounces to 36 ounces, which is still lightweight. If you will be covering many miles a day, every ounce counts, you will need the lightest sleeping pad that offers the warmth and comfort you need. Air pads provide the highest weight-to-performance ratio. If you’re on a budget, need to go light and don’t need a lot of comfort or insulation, foam pads are cheap and relatively light. If you will only be covering a couple of miles or backpacking in the winter, you can afford to carry a few extra ounces for the comfort and warmth. You definitely want a hassle-free sleeping pad whose conveniences you will enjoy while backpacking. A foam pad presents the least hassles. All you have to do is unfold and lay it down. A self-inflating pad is also very convenient since it expands on its own after you open the valve. An air pad equipped with an integrated hand pump is also a convenient option since you don’t have to huff and puff every night to fill it up manually. Sleeping pads come in a wide range of lengths. The regular length is 72″ but there are longer (78″ – 80″ ) and shorter (48″) options. The choice comes down to your height, comfort, and weight preferences. Most backpackers prefer the comfort of full-length pads that cushion their heels and insulate their legs and feet. If you really want to minimize weight and bulk, you can opt for a short pad that won’t cushion your legs. The other sleeping pad dimension to pay attention to is the width. The width to go for will depend on your sleeping style, body size, and personal preference. The standard sleeping pad width is 20 inches. If you’re a large person, a back sleeper or move around a lot, you may prefer a wider pad – 25 or 30 inches – as long as it will fit in your tent. If your backpacking sleeping bag has a built-in pad sleeve, check the sleeve width before you buy a pad to ensure you get a size that will fit. Backpacking sleeping pads come in a variety of shapes. Tapered, oval or mummy shapes minimize weight and bulk due to their trim shape that eliminates unused corners. Rectangular pads are roomier, more comfortable and will give you better rest if you move a lot in your sleep or tend to spread your legs and hands while sleeping. The downside is that they are heavy and bulky. After an exhausting day on the trail, the last thing you want is a sleeping pad that needs a lot of time and energy to set up. Closed-air foam pads are the easiest to use. Just throw it down and lay your sleeping bag on top. A self-inflating pad is another effortless option. All you have to do is open the valve and leave it to expand on its own. If you prefer an air pad, choose one that inflates quickly. Some pads have larger openings that allow rapid inflation with fewer breaths. 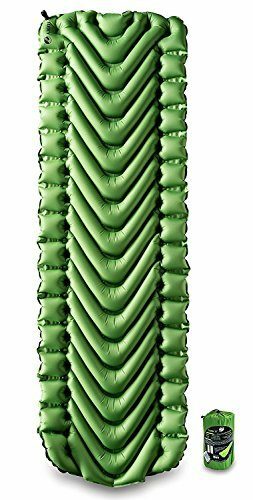 If you like one that requires a lot of huffing and puffing to inflate it and would leave you light headed if you were to blow it manually, ensure it has a built-in hand pump or bring along a packable hand pump to make inflating quick and easy. A compact sleeping pad when packed is a must when backpacking. Air pads pack down impressively small and will easily stow inside your backpack. Self-inflating pads pack down larger due to the foam component. Foam pads are the largest and are usually attached to the outside of a backpack. A bulkier sleeping pad that comes with a stuff sack that compresses it into a small size is also a great option. Be sure to look at the packed size of the pad you’re considering. Q: Do I Need A Sleeping Pad For Backpacking? A: If you want to sleep comfortably while backpacking, you need a sleeping pad. Warmth and comfort are essential for a good night’s sleep. It is hard to sleep on a hard surface and the cold ground can take away your body heat very fast. This is why restful sleep outdoors can be tough to come by even when you’re super exhausted. 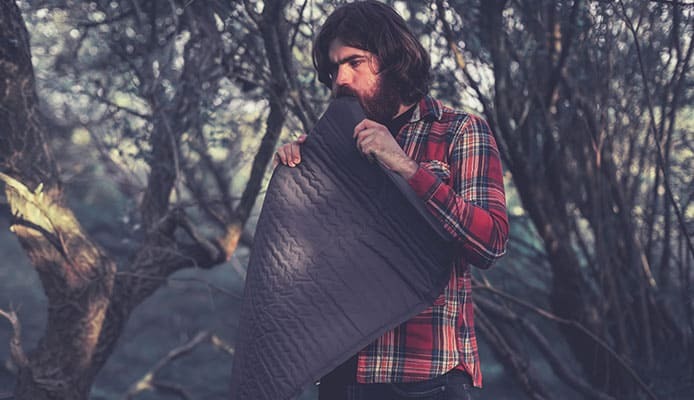 A sleeping pad provides insulation and cushioning from the cold, hard ground ensuring you’re warm and comfortable enough to fall asleep outdoors. Q: What Is The Difference Between Lightweight And Ultralight Sleeping Pad? A: Both lightweight and ultralight sleeping pads are light in weight. Ultralight sleeping pads are the lightest and usually weigh under 18oz (500g). Lightweight pads weigh between 18oz (500g) and 36oz (1kg). A: R-Value for sleeping pads is a measure of the level of insulation a sleeping pad provides or its ability to resist heat loss. It ranges from 1.0 to values of 11.0 or more. The higher the R-value, the more the pad resists heat loss and the warmer it is. R-Value is assigned by manufacturers. It is helpful but not an exact science, as there is no standard for testing and assigning it. A quality backpacking sleeping pad is one of the best backpacking gear investment you will ever make. 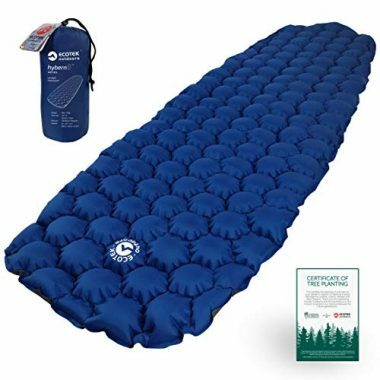 The best backpacking sleeping pad offers insulation and cushioning ensuring you sleep comfortably after a long day on the trail. When you wake up alert and energetic, you’ll be safer and have more fun in the wilderness. Make sure you take proper care of your sleeping pad while out there so it can give you long lasting service. Happy backpacking! Which of the top rated ultralight sleeping pads on our list is your top choice? We would love to read your thoughts or experience with the backpacking pads we’ve reviewed! Feel free to share in the comment box below!